Some friendships are just never meant to be. All you give is hugs. All they give is pain. I like that the scissors’ got teeth in the handle! Are there live pencils, papers and rolls of tape on that planet, too? That would be an interesting sight! Scissor-man is smiling at least. And is Biff waving goodbye? Why yes, I think he does! 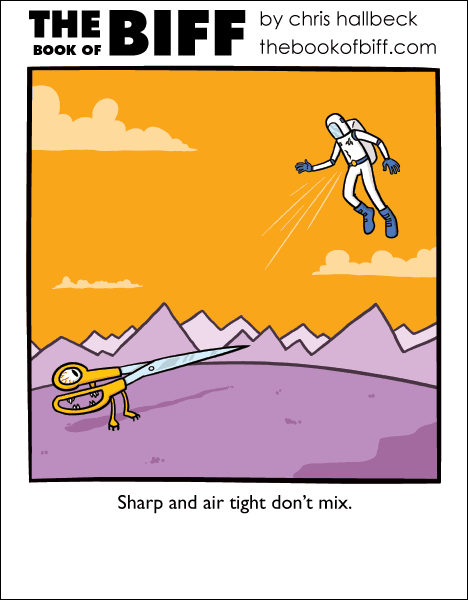 Maybe Scissor-man is actually helping Biff to get back home to Earth (or whatever planet he lives on) by puncturing his space suit to make him fly away, because his spaceship was broken or something!